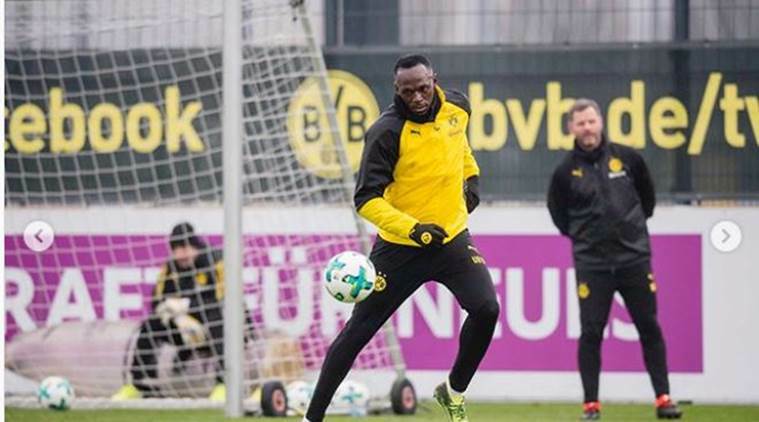 Eight-time Olympic gold medalist Usain Bolt trained with German football club Borussia Dortmund on Friday. The sprint star, who announced his retirement from the track in 2017, posted photos of the training session on his Instagram account with the caption, “First day of training.” The world record holder in the 100m and 200m sprint was seen training along with some of the biggest stars from the club. In one photo he was seen taking instructions from the 2014 World Cup final goalscorer Mario Gotze. He was also seen taking instructions and being assessed on his physical routine by BVB’s dynamic left-winger Marco Reus. Bolt received his official Dortmund jersey and shoes from the manager Peter Stoeger himself. He was also seen playing football with Dortmund stars at Westfalenstadion Stadium, the home ground of the club. Earlier this month, the Jamaican announced that he will be playing in a charity football match at Old Trafford on June 10 as the captain of ‘Soccer Aid’ against England. The match is aimed at supporting children in danger all around the world. Bolt is the only sprinter to capture 100 and 200-meter track titles at three consecutive Olympics. He holds the world record of 9.58 seconds in the 100m and 19.19 in the 200m, both set in Berlin in 2009.